Welcome to Westwood Farms. We are a family owned and operated farm located in scenic Madison County, Virginia. 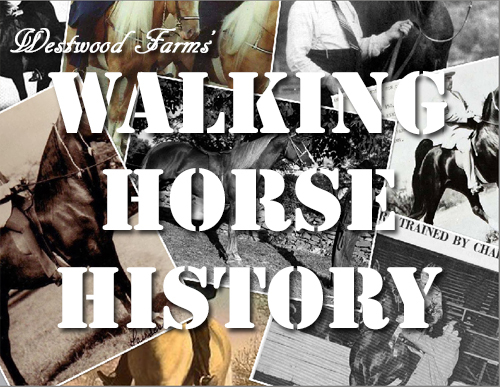 We breed and sell Walking Horses and Kentucky Mountain Saddle Horses. ​We believe in producing "working family horses." We carefully select crosses to produce an intelligent, smooth gaited, athletic, surefooted mount with a good disposition and desire to learn. They can excel at a variety of tasks from the show ring to the trail. Horses are naturally active, social animals. By allowing our horses to live in the most natural environment possible, we reduce nervous behaviors (cribbing, weaving), alleviate excess energy, and improve their mental, physical and emotional heath. ​We stand four TWHBEA= registered stallions at stud. 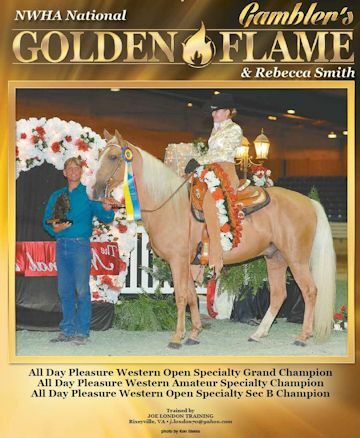 Golden Gambler is an "AA" buckskin who has proven himself as a sire. Rembrance's Merry Snip is a foundation bred grandson of Midnight Sun and Merry Boy's F88. Gambler's Midas Touch WF is an "AA" perlino son of Gambler who offers a guarantee of "gold" when bred to bay, black or chestnut mares. The Tennessee Stud WF is a big, butterscotch gold buckskin, great minded, true walking son of Golden Gambler. ​We have a select group of horses for sale. If you don't see what you are looking for call Stephanie at (540) 825-1300 and she may be able to help you find it. Your browser does not support inline frames or is currently configured not to display inline frames. Go to http://www.westwoodfarms.net/copyright.html for Copyright information.